This Is Our Brand New Health & Fitness Dumbbell Set. It Will Prove To Be A GreatAddition To Your Home Gym. This Set Of Weights Will Enable You To Keep YourBody Fir And Strong By Enabling You To Perform A Variety Of Muscle BuildingExercises. It's Designed To Develop You Leg, Hip And Back Power. With It YouCould Do You Gym Any Time You Want. Don't Hesitate To Buy It! Threaded Metal and End Collars for Strong Grip- The barbell plates can strongly grip the metal threaded rod. With the specially designed collars at each end, it is super safe for your everyday workout. Detachable Handle Bars- Easy To Store And Transport With Detachable Handle Bar. You can take it anywhere in your bag. 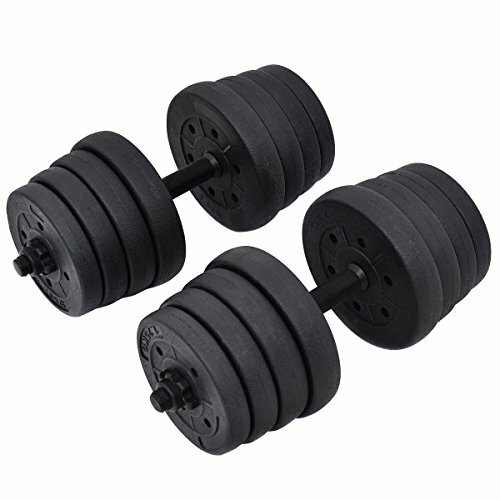 Changeable Weight Setting- The dumbbell set is ideal for the exercise of your upper body, especially for huge arms. The weight is adjustable according to your physical condition. It makes your workout effective. Ideal for Home Strength Training- The dumbbells makes it easy for you to take the strength training at home. Your home is your gym, saving time and energy for you. Durable and Anti-Rust for A Long Time Use- Durable plates covered with black paint finish preventing rust and corrosion for lifetime use.